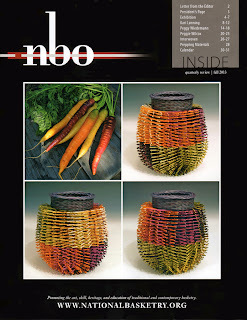 The National Basketry Organization's Quarterly Review is out. 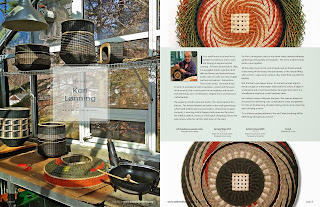 Their president, and fellow basketmaker, Lois Russell, wrote a great article about my home and work, with an unusual slant. 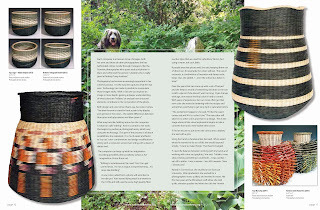 In line with NBO's purpose "to promote the art, skill, heritage and education of traditional and contemporary basketry," Lois wrote about how basketry is only a part of my life. We talked about how nature, travel, and photography also have a role and significance in how I approach my work. Seeing the architecture in plants and how I view details through a camera lens, also feed into my creative process. She quoted me as saying, "It is all about paying attention ... [and] noticing the little things that get you excited." The article is loaded with basket photographs and includes a peek inside my greenhouse where I do the encaustic. Since the greenhouse had an exhaust system to draw out excess hot air, it provided an appropriate, ventilated space in which to work with the wax fumes. The photo shows the skillet in which I melt the encaustic, a combination of bees wax and damar resin, the brushes I use to apply the molten medium to my work, and the heat gun used to melt the wax/resin into the reed. I spend a lot of time in the garden with Emma (in the photo below) and Kitt, the Cat, paying attention to colors and textures. Another source of basket inspiration is viewing and editing photographs on Instagram using online photo applications where I can experiment with color combinations. The basket in the lower left, is a result of one such experiment. A client sent me a grey and orange tile to suggest colors for a custom set of baskets. I worked on a series of dye lots for her, then wove the pair of baskets shown below. Finally, on the right, is information about a workshop I'll be giving at the North Country Studio Workshop (NCSW), in Bennington, VT at the end of January 2014. 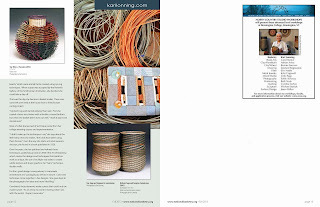 In this class students will be encouraged to experiment and take their basketry beyond strictly functional vessel forms. NCSW is offering 13, 5-day workshops in various media taught by nationally recognized craft and fine art professionals in a range of media. You can go to their website for more information. To see my work in person, I'll be exhibiting in 2 juried craft shows this fall. The Philadelphia Museum of Art Craft Show will be open November 6-10, and CraftBoston will be December 6-8. I hope to see you at one of these shows. You can see the work I'll be bringing on my website: karilonning.com. Very cool, I can't wait to receive my copy. Your instagram photos are always interesting and amazing. Thanks Tony! Instagram makes my love of photography so easy to share. It's nice to hear that people enjoy what I post. This short article is usually mind-numbing. Once i go through this short article, I relished.